Wings Of Eagles and Cliffs Of Moher could go their separate ways for their next race after giving Aidan O’Brien a one-two in the Investec Derby on Saturday. The Ballydoyle trainer is thinking of aiming Epsom hero Wings Of Eagles at the Dubai Duty Free Irish Derby at the Curragh, with Cliffs Of Moher possibly dropping back to a mile and a quarter for the Coral-Eclipse Stakes at Sandown. Wings Of Eagles sprang a 40-1 surprise in the premier Classic in the hands of Padraig Beggy, coming late to deny Ryan Moore on Cliffs Of Moher by three-quarters of a length. O’Brien, who was winning the Derby for the sixth time, said: “They seem to be fine. Obviously they haven’t done much today, but they seem to be fine so far. 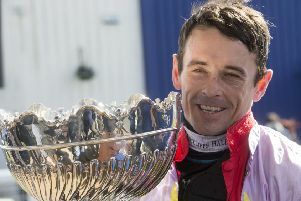 At Perth yesterday, Beeves won a dramatic Horizon Parking City Of Perth Gold Cup as he collared a faltering Aerlite Supreme in the shadow of the post to score by a neck. In front of a bumper 8,000 crowd, Warren Greatrex enjoyed his first course success when Attest completed a hat-trick in the Perth Is The Place To Be Handicap Hurdle. l Ayr is offering free entry to this evening’s meeting, which is sponsored by the Scottish Bookmakers Association. All racegoers can enjoy the seven-race card free of charge and do not need to book tickets.